The Book: Cover (MacBook iSight). The Book: Inside (MacBook iSight). The Book arrived today while I was at work. I ordered it from Apple ten days ago on June 6, the night I updated my PDF for SoFoBoMo. If you look closely at the first photo, in the background you'll see two photos and a painting. The photo on the right was one I took back in 1982 of the tall ships in Newport, RI. I took that with my first SLR, a Pentax K1000. This book is done. It's been a great ride. I'll continue to follow the books as they flow into the SoFoBoMo site over the next two weeks. If you haven't looked at any of them, you should. There's some great work that folks have done. SoFoBoMo is done for me. I had the book printed through Apple, and it should arrive on Tuesday the 16th. I'm proud of what I've accomplished but I'm left with what I can only describe as an emptiness. What's next? Where do I go now? This was an extraordinary learning experience for me, one that stretched me in many areas, some outside of the photography domain. Within that domain however, I think I learned some basics of the craft of photography. I took lots of chances, one of the most significant for me being photographing exclusively in RAW at the airport in the final session. I learned some new image editing techniques, and learned how to edit a huge set of photos down to a viewable set. I began the project, ready to tell a story, and a modestly different story developed. It's not much different from when I've written short stories in prose; done right, for me anyway, the story takes some of its own direction if I let it. I shared my project and photos at work. We work in air traffic control R&D, so on one hand it's a potentially receptive audience and on the other it's a tough one. I'll add that when I settled on the topic "Airport" for my project, I kept the people with whom I work in mind. Certainly I did this project for me, and I did it for the people involved in SoFoBoMo, but I also did it for the folks at work. What's next? Where do I go now? I have no illusions about who and what I am. There's a reason for the name of this blog being The Mathemagician. I love math, I love programming, I love problem solving, and I love aviation. I've kept current over the years and intend to remain employable until the time I reach retirement, which isn't that many years away. Am I any good with a camera? Am I any good as a photographer? Do I tell a story through my photographs? Do any of them evoke reactions from people viewing them? Do they uplift? Do they celebrate life? Given my learning has been strictly through reading and spending time behind various cameras, my knowledge, skill, and experience are probably spotty, uneven. I've also spent time on some photography forums and frankly find them wanting. I wouldn't look for criticism on a piece of code from some random person on the 'Net. Why would I do that with a photo? That's one part of the realism equation. Here's the other. I was completely driven during SoFoBoMo 2009. I enjoyed it thoroughly. I worked to get the photographs I wanted. I worked to learn. For three weeks I had the time of my life. It's over now, and that's fine. Projects begin, projects end. Now I want to do more. Over the coming months I'll make decisions on what I want to invest in photography, time being the primary fungible commodity. The most important investment however is me: How much of me do I want to invest in photography? Runway Lineup Over Gravelly Point (Canon XSi). I thought I was done with my SoFoBoMo project on June 1. I'd reduced 2,941 photos to a group of 41. 2,900 were rejected. So be it. What I'd chosen were just fine. Over the last few days I've been mildly disconsolate, having finished my project. It happens with all projects I complete. Yet I knew this one wasn't entirely over. 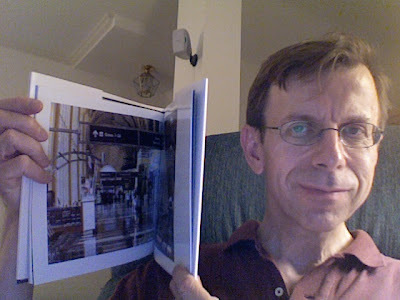 From the start, my intention was not simply to create a PDF, but a hard cover book. In fact, I actually created the layout for the print version and simply reduced it with minor adjustments for uploading to sofobomo.org. I used Apple's iPhoto book service, first creating a large hardcover, and then copying it and modifying it to a medium soft cover. Except for duplicate end-paper photos and similar minor flourishes, the two are essentially the same. In practice, the 22MB printable book dropped to 12MB, with minimal reduction in screen viewing quality. A couple nights ago I realized there were at least two additional photos I really wanted to include. Tonight I revisited the collection. While I didn't review the entire lot, I did view a great many of what I thought might go into the book. The photos would fill white pages opposite the text pages. I find myself pleasantly surprised that while I added five new photos, it was difficult choosing even those; the project was essentially complete on June 1, but now was finished on June 6. That's when a few things struck me. First was that I could update the SoFoBoMo book in iPhoto if I wanted. Next, I wondered how much larger it would be. I thought it might actually remain under the upload limit. Finally I realized that I still have until June 12 to "complete" my project. I knew that I could replace a PDF on the site if I wanted. I updated the book through iPhoto. I thought about the implications of updating it. I'd already passed the book around at work, and have received very good responses to it. That's reassuring, given I work in aviation. Would I be as the Evil George Lucas, updating Star Wars throughout his life?! If that's as evil as I become, then so be it. It is my destiny. The hardcover book has now been ordered, and I think now my SoFoBoMo project is complete. This is the best book and photo project I've done to date. Thank you again Paul Butzi for this great idea that is SoFoBoMo. Thank you to all of the SoFoBoMo participants. I've been looking at the completed books, and they're great! All the best to everyone working on their projects and/or supporting SoFoBoMo! So it's done. I've completed and uploaded my book for the SoFoBoMo event. 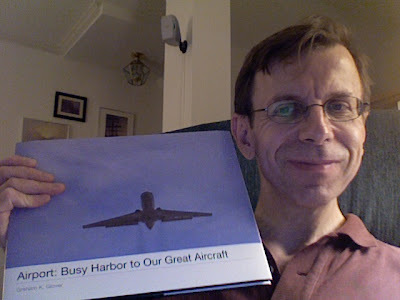 In three weeks I've created this book that celebrates aviation. I think it's coherent and viewable. I'd like to think it's a bit artistic. Most of all I hope that it's enjoyable to anyone looking at it. This is the ninth photo book I've created and the first for SoFoBoMo, but certainly the first that was done as an artistic project. It's no more than a student work, but hopefully it shows well. Over the last three weeks I've gone from using a very nice digital point and shoot, the G9, to an entry level DSLR, the XSi. My original plan was to do this project with the G9. Canon made the price on the XSi irresistible however, and my original plans were becoming quite dynamic. Plans and expectations changed so much over the last three weeks that my last session was shot entirely in RAW without jpeg backup; a couple white balance corrected photos made it into my book. This was an exercise in growth in many areas. I'm a math and computer geek. I had to find the nerve to talk with complete strangers to successfully take photos of the WWII vets at the airport this last Saturday. I don't do that well at all, but I had to do it if I wanted to get the photos and honor those heroes. I had to push a bit with the airport operations folks to get permission to take photos, and in the end they were great and all went well. I found myself enjoying chatting for a few moments with the TSA folks at the airport. I very much thank Paul Butzi for creating the SoFoBoMo event. I also appreciate his patience with me when I posted a rant Saturday night. I was more affected by the experience with the veterans than I realized, and lost sight of part of what this event is about. He helped correct my course. Thank you Paul, and I'm sorry. Over the coming days I may realize more what this event has been about for me. Tonight I'm tired, but not exhausted. It's been fun. I don't know how many hours I've spent on this project, but I really can't think of a time when it's been other than a positive experience. It was all time well spent. The Old Terminal (Canon XSi). What an experience it was yesterday at National Airport. In addition to the WWII veterans, I covered lots of ground in the terminal. The first photo for this post is just one of many I took. It's light, bright, airy, colorful. It's alive, and busier than the photo might suggest. After spending lots of time around the main terminal, I headed south toward the older terminal. What I saw is in the second photo. Years ago this was frenetic with all manner of activity, smoky, loud. Alive. On the left were the ticketing counters. At the far end was a news stand and upstairs a restaurant. I flew out of here many times, and saw a few celebrities in here. Today it's little more than a forgotten museum. The final section of terminal south of here is still active, but this one is just empty and quiet. As of today, Sunday May 31, I have reduced over 2,900 photos to a collection of just 72. It will be further reduced over the next day or two to something closer to 40. This SoFoBoMo event has been exhilarating, challenging, and for a moment frustrating. It has also been supremely rewarding. I can honestly say I didn't expect to experience anything like this. It's hard to believe my project has been going for just less than three weeks. When I was given permission to photograph at Ronald Reagan Washington National Airport by the airport operations manager, he told me of some special flights that would be arriving on Saturday May 30, carrying many World War II veterans. I made sure I would be there on time. When I arrived at the airport this morning, I took some photos of the inside of the terminal and then took some of the terrace and tower. National is actually a very pretty airport. I knew it was, but got to know it just a little better today. When the time came to await the veterans, I went to the area and sat at a table drinking some water. Then I spoke to a gentleman whom I figured was with the vets; he was. I ended up talking with him, a pilot, a few folks from TSA, and gave out some personal business cards. I was hoping to take lots of photos of these heroes and give the photos to them via email. It would be my way of giving some small honor back to them. These people visit DC through the Honor Flight Network. It's a great thing this organization does. In addition to the Honor Flight Network though, the USO helped, TSA supported them, USAirways supported them, the airport operations folks helped, and a whole bunch of individuals traveling with these heroes were there in support. Delta Regional Jet About to Land (Canon XSi). I received very good news today. I now have permission to take photos inside the terminal at National on Saturday. I am looking forward to it. The weather is supposed to be good that day too. I was originally planning to go to the airport on Monday morning of this week, Memorial Day. Last week someone on a photography forum suggested that I should be careful. My thought was, 'You're right.' I looked at the airport's website for information regarding photography, and found nothing. I contacted the facility folks at the airport last week and they responded within a day. I'd told them who I was and my intentions. The person who responded asked a few other questions, and told me what they expected of amateurs and professionals; I'm clearly the amateur. Their greater concern is for the passengers' privacy, a reasonable position, that. I changed my plans so that were I to go, it would be on Saturday the 30th. Today, Thursday May 28 I received official permission. This shouldn't be a story per se. I've read of cases where photographers encounter difficulties with law enforcement officials. Doing a little homework up front has made this a non-issue. We hear all of the bad stories. This is one of those Good Ones. You need to hear of these too. Thank you, Sir. My only hope is that I'll be up to the photographic challenges of the day on Saturday. I think it will go just fine. I work in air traffic control R&D for The MITRE Corporation in McLean, VA.